Bring a large stock pot of water up to a boil. Season the water with about a tablespoon of salt. Cook per package directions until just under al dente. Bring a large high sided skillet up to heat over medium. Add in the butter and cook until it smells nutty and you see little brown flecks on the bottom. Next whisk in the miso and 1/2-3/4 cup of the pasta cooking liquid. Add in a good amount of freshly cracked pepper. More than you think you’ll need. Reduce the heat to low. Fill a medium size sauce pot about halfway full with water. Add in 2-3 tablespoons of vinegar and bring up to a simmer. You know it’s ready when it looks like Sprite and is about to start boiling. By this time the pasta should be ready, add it to the miso brown butter sauce and toss together. Add more pasta water if it looks too dry. Taste for seasoning, adding more salt or pepper if needed. Keep on a very low heat while you poach the eggs. Crack 1 egg into a small bowl. Once the water is ready, make a whirlpool in the pot with a slotted spoon and carefully pour the egg into the swirling middle. Cook for 2-3 minutes or until the white is set but the yolk is still runny. Continue with remaining eggs. 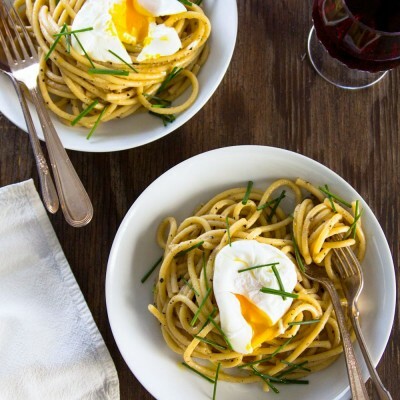 To serve place some of the pasta in a shallow bowl and top with 1 poached egg, a sprinkle of chives and a little more black pepper. Serve immediately.